I found (and then adapted) this one on the BBC good food website which has quite a few almost vegan meals if you’re willing to have a search. I’ve looked at every recipe on The Vegan Stoner now. I love how simple it is and how cute the illustrations are! Defo worth checking out, recipes usually need a specialist ingredient though. Cooking Time: Just over an hour, only need to be in the kitchen for the first half. 1. 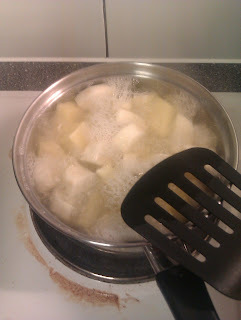 Chop the turnip and swede into small cubes and boil for around 14 mins. (put the swede in by itself for the first few minutes... I forgot.) Preheat the oven to 180 C.
2. Drain and mash the veg with some marg. 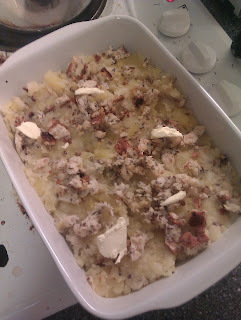 Add ¾ of the breadcrumbs, egg replacer and goldon syrup. Mix well. 3.Place the mixture into a baking dish and smooth the surface. 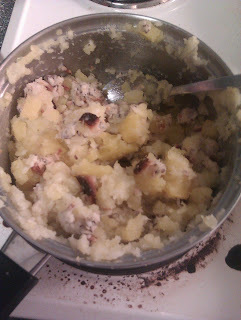 Mix the remaining breadcrumbs with a little oil and lots of thyme. Layer this on top and dot on some marg. 4. 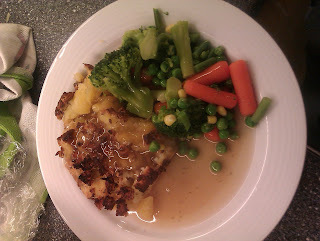 Place in the oven for 35 mins, keep an eye on it near the end, boil up some veggies and use the water to make gravy!